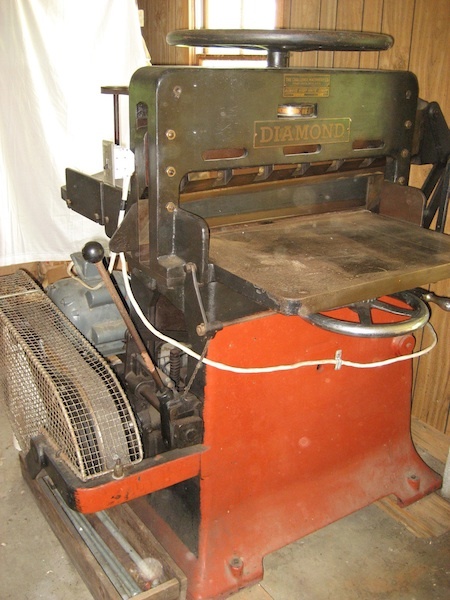 I just acquired a Diamond 30 1/2” paper cutter by the Challenge Machinery Co. I’m not sure how old it is but I’m guessing 1940s or 1950s. It is old enough that the clamp is lowered by a huge wheel on top. The serial no. is 24451. My question is how do you release the backgauge? It obviously is moved by the smaller wheel under the table, but the wheel won’t turn. There is a handle to the right of the wheel that seems connected to the backgauge mechanism but I can’t seem to move it either. I haven’t plugged the cutter in yet because I wanted to understand it first. I’ve run a Challenge Champion 305 for many years so I am not unfamiliar with cutters but this has me stumped. Look for a set screw somewhere that would hold the back gauge to the frame. They are typically some kind of thumb screw. I could be mistaken on this model of cutter, but It seems like that would be something to look for. Looks like a nice cutter you have there. Isn’t it the lever to the right of the backgage handwheel that locks it? I worked with a 34” Diamond a while back and that’s how I remember it. The lever to the right of the backgauge wheel is the lock. I have the exact same cutter. I called Challenge and was told that the serial number indicated it was made between 1938-1941, but they didn’t have records that went that far back to give me an exact date. I never had any problems with my lock, but you may try lifting it up before moving it to your right. Just a guess made from looking at how mine operates. With my machine sometimes the right-hand safety lever will get stuck and the cutter will engage when only using the left lever. It has a motor brake on it that gets pretty damned loud sometimes, but over all it is a very nice machine. I checked my machine and I can engage or disengage the lock no matter what position the blade is in. If it has been sitting for 10 years I would lubricate the rod that the backguage travels on really, really good. I use 30 weight motor oil. At the very back of the machine right next to the sprocket is a small cup with a small lid on it that you add lubricant to. Looking at the way my machine operates if the rod isn’t well lubricated it would be very difficult to to disengage the lock. I would try greasing up everything around where the backguage is mounted to the rod and add plenty of lubricant to the little cup at the rear. It may be best to use kerosene or another chemical first to break things up before using oil or grease, but I’m not sure if that would cause a problem or not.